The Gandelus, Lombard traders family settled in Troyes since 1256, are building this amazing hotel (also called the hotel Gandelus) in 1550. The Lombards, northern Italian, were famous throughout Europe as changers or bankers. 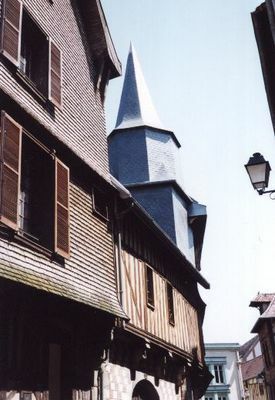 The adjacent street, called "Montée des Changes," led to the at-Pain-Market where were also located their agencies at the time of the Champagne fairs. The ground floor of the building, built in the Champagne checkered, has two floors covered with shingles (oak tuilettes). The staircase tower of the sixteenth century. has a conical slate roof. The courtyard is half-timbered.